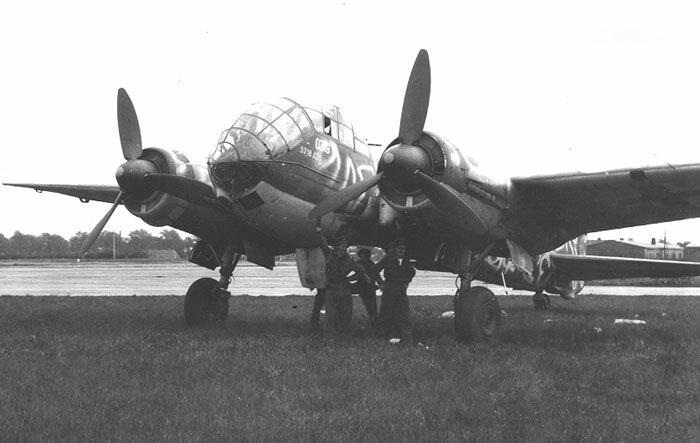 Here is a photograph of a Junkers Ju 188A taken by members of 421 (Canadian) Squadron. Squadron Leader Danny Brown (left) and 421 Squadron Adjutant Lloyd Hennessy (right) can be seen in the photograph. This interesting aircraft wears a rough squiggle of a pale colour (probably RLM 76 Light Blue) over its 70/71 Green uppersurfaces. The lower surfaces would be painted RLM 65 Light Blue. The extreme tips of the spinners are painted in the Staffel colour, possibly yellow or red. The numbers on the forward fuselage are also of interest.